The most common shoulder conditions affecting the biceps are injuries to the cartilage and tendons that attach the biceps muscle to the shoulder bones. These include SLAP lesions, tendonitis, and tendon rupture. Shoulder instability, a dislocation, or a rotator cuff tear could also cause damage to these tendons and cartilage. A SLAP lesion is an injury to the upper part of a rim of cartilage called the labrum. The labrum runs around the top of the socket element of your shoulder’s ball and socket joint. The long head of biceps inserts into the labrum at an area called the anchor. Injuries to this area therefore affect the biceps. Tendonitis is the painful inflammation of a tendon. It is normally caused by an injury, irritation or instability in the tendon. Pain is often felt in the upper part of the arm and around the front of the shoulder joint. The biceps muscle has two shoulder tendons; one that passes over the top of the shoulder (the long head of biceps tendon, or LHB) and one that passes to the front of the shoulder (the short head of biceps tendon, or SHB). A biceps tendon may rupture (or break) at the shoulder or the elbow. In the shoulder, the LHB tendon may rupture causing the muscle to bunch up. This can give the bicep a ‘Popeye’ appearance. Why do biceps problems happen? SLAP lesions and tears are normally caused by trauma. It is most commonly seen in sportspeople as a throwing or lifting injury, or a rugby tackle. A shoulder dislocation can also damage the labrum and result in a SLAP lesion. Biceps tendonitis is an inflammation of the long head of the biceps tendon (LHB). It can be caused by an injury, such as a fall or by lifting something that is too heavy. It can also be caused by the rubbing of bone spurs against the tendon. Instability of the tendon may also be caused by a rotator cuff tear, particularly at the front of the shoulder (the subcapularis tendon). The LHB can rupture in association with a rotator cuff tear. If you have been suffering from chronic shoulder pain, a tear of the LHB can result in significant pain relief as it is the rubbing of the partially torn tendon that is often the main cause of pain. Once it tears it stops rubbing and the pain may be relieved. The LHB can rupture without a rotator cuff tear. This normally happens when you try to lift something that is too heavy. How common are biceps problems? SLAP lesions and tears mainly occur among athletes who take part in contact sports and those whose work involves overhead activities. Tendon ruptures are common among more elderly people with rotator cuff tears. Ruptures without rotator cuff tears are most commonly seen in younger people such as weightlifters who may have attempted to lift a weight in the gym that was too heavy. Typical symptoms include pain at the top of the shoulder, especially with overhead activities. Sometimes a clicking sound may be heard with movement of the shoulder. People with SLAP tears also experience pain with specific activities, such as lowering into a bench press or throwing. The most evident symptom is pain. Pain is often felt at the front of the shoulder. This is frequently worse when you try lifting weights in front of your body or when lifting something overhead. When LHB ruptures without a rotator cuff tear, pain is normally felt straight away and the patient may have heard a popping sound. Bruising will be seen on the bicep soon after the injury and the muscle will bunch up, giving a ‘Popeye-like’ shape to the muscle form. Mr. Cole will talk to you about your shoulder symptoms and your shoulder’s history. He will examine your shoulder and assess your range of movement and whether there are any visible signs, such as the Popeye-like muscle, or audible signs, such as a clicking sound. He may use a number of clinical tests to examine for tenderness and pain to indicate a biceps problem. Ultrasound is a good way of revealing evidence of biceps tendonitis and rotator cuff tears. An MRI can highlight any damaged areas to cartilage, ligaments, tendons or muscles. MRI stands for Magnetic Resonance Imaging. It uses a powerful magnet to obtain three dimensional pictures of body structures. It is a non-invasive and painless procedure. To obtain a clearer picture, Mr. Cole may request a MR Arthrogram. This is largely the same as a MRI, but it also involves injecting a type of dye into the shoulder, so that greater detail can be seen on the final image. This is the best way of diagnosing SLAP tears. Especially in cases of SLAP lesion, Mr. Cole may suggest using arthroscopy. This is keyhole surgery, conducted under full anaesthetic, which uses a tiny camera to pinpoint and diagnose the injury. In most cases Mr. Cole will complete treatment during the same procedure. The operation takes place as day surgery and you will not normally need to stay overnight in hospital. Painkillers and anti-inflammatory medication will help control the pain and reduce any swelling. These may be in the form of an injection directly into the damaged joint. Complete rest from lifting heavy objects will give your tendon the chance to heal. Treatment will include painkillers to make you feel more comfortable and anti-inflammatory medicine to reduce any swelling. These may be administered directly into the site of the inflammation via an injection. To help locate the exact point, ultrasound may be used. A course of physiotherapy will be devised for you to help strengthen your shoulder muscles and regain full movement in your biceps. Painkillers will help you to control any pain you may feel. However, to reattach your tendon to the bone, you will need an operation. The tear or break in the cartilage can be repaired during keyhole surgery. Using special bone anchors (screws) and stitches, the torn labrum is attached back into its normal position. Sometimes, the injury is too severe to be repaired, or too minor to need reattachment. In such cases, it is smoothed down (debrided) to create a stable surface. If conservative treatment fails, Mr. Cole may suggest an operation. Isolated biceps tendonitis can be treated with an arthroscopic (keyhole) operation and either dividing the long head of biceps (tenotomy) and this stops it from rubbing and causing pain, or by pinning it to the top of the humerus bone (tenodesis). If your rotator cuff is damaged, Mr. Cole may suggest an arthroscopic rotator cuff repair. This is normally completed as day surgery and you will be able to go home on the same day as your operation. In a procedure called a biceps tenodesis, the LHB tendon is reattached to the bone just below the shoulder. Special screws are used to anchor it to the bone. The screws are strong enough to enable you to move your arm relatively soon after surgery, without the need for a lengthy period of immobilisation. The operation is arthroscopic keyhole surgery and will not require you to stay overnight in hospital. What is a SLAP lesion? A SLAP lesion is an injury to the upper part of a rim of cartilage called the labrum. The labrum runs around the top of the socket element of your shoulder’s ball and socket joint. The SLAP part of the labrum anchors one of two tendons of the biceps muscle. Any injury to it will therefore impact on the biceps. SLAP is an acronym for Superior Labrum Anterior-Posterior (SLAP). This is medical shorthand for describing the cartilage’s position. It literally means upper rim front-back. SLAP lesions and tears are normally caused by trauma. It is most commonly seen in sportspeople as a throwing or lifting injury, or a rugby tackle. A shoulder dislocation can also cause a SLAP lesion. The tear or break in the cartilage can be repaired during keyhole surgery. Using special bone anchors (screws) and stitches, the torn labrum is attached back into its normal position. Sometimes, the injury is too severe to be repaired, or too minor to need reattachment. In such cases, it is smoothed down (debrided) to create a stable surface. Mr. Cole will discuss your specific situation in more detail with you. Your SLAP repair operation will be day surgery. This means that you won’t normally have to stay overnight in hospital. However, you may feel more comfortable if you bring your own dressing gown, slippers and toiletries. After admission, you will be seen by Mr. Cole and by your specialist anaesthetist. They will talk about the operation and the anaesthetic with you and, where possible, discuss your preferences. Nothing will be done without your permission on the day. The operation is carried out under a general anaesthetic. After your admission, you will be given a pre-med. This is usually in tablet or liquid form. It will help you relax before your operation. Normally you will be given an interscalene nerve block during the operation. This acts as an excellent pain relief and for a short while after your operation your shoulder and arm may feel numb. When this wears off, your shoulder can feel more sore. You will be given some painkillers to take after the operation. When you begin to feel sensation returning to your shoulder (often a ‘pins and needles’ feeling), you should start taking the pain medication that you have been given. Don’t wait for your shoulder to start hurting, as pain is best managed before it gets acute. To keep the pain under control, use your medication regularly to begin with. After a couple of days, you can begin to lower the amount you take and then cease the medication altogether once any pain has subsided. If the pain does not seem to get better, or if you need more pain medication, please contact Mr. Cole. Persistent pain or stiffness in or around the shoulder (10–20% of patients could still have some symptoms after the operation). A need to re-do the surgery. In some cases it is possible for the cartilage to re-tear. The risk of this happening depends on the size of the original injury and how well it heals following the operation. In a biceps tenotomy procedure, the LHB tendon is removed from its shoulder attachment. Any damaged or inflamed tissue is removed from the joint. In some cases weakness or discomfort in the bicep muscle can be felt after surgery, but this is usually minimal. Occasionally, a ‘Popeye’ appearance may happen. The operation is arthroscopic keyhole surgery and will not normally require you to stay overnight in hospital. You will also not need to keep your shoulder immobile after the surgery. In biceps tenodesis, the LHB tendon is detached from inside the shoulder joint and is reattached to the bone just below the shoulder (the humerus bone). Special screws may be used to anchor it to the bone. The screws are strong enough to enable you to move your arm relatively soon after surgery, without the need for a lengthy period of immobilisation. As your biceps operation will be completed as day surgery, you won’t normally have to stay overnight in hospital. However, you may feel more comfortable if you bring your own dressing gown, slippers and toiletries. After admission, you will be seen by Mr. Cole and by your specialist anaesthetist. They will talk about the operation and the anaesthetic with you and, where possible, discuss your preferences. Nothing will be done without your permission. Normally you will be given an interscalene nerve block during the operation. This acts as an excellent pain relief and for a short while after your operation your shoulder and arm may feel numb. When this wears off, your shoulder can feel more sore. You will be given some painkillers to take after the operation. When you begin to feel sensation returning to your shoulder (often a ‘pins and needles’ feeling), you should start taking the pain medication that you have been given. Don’t wait for your shoulder to start hurting, as pain is best managed before it gets acute. To keep the pain under control, use your medication regularly to begin with. After a few days, you can begin to lower the amount you take and then cease the medication altogether once any pain has subsided. Although the operation is to relieve pain, it may be several weeks until you begin to feel the benefit. If the pain does not seem to get better, or if you need more pain medication, please contact Mr. Cole. You may have some bruising around your shoulder and upper arm. This will gradually disappear over a period of a few weeks. A cold compress can also help with pain relief and swelling at the site of your operation. If you use an ice pack it is important you keep the wounds dry. You can repeat this several times a day. Unwanted pain or stiffness in or around the shoulder (up to 5-10%). Damage to the nerves and blood vessels around the shoulder (less than 1%). In a biceps tenotomy, there can be some cases of weakness or discomfort in the biceps muscle after surgery, but this is usually minimal. Occasionally, a ‘Popeye’ appearance may happen. You will usually be invited to attend an outpatient clinic 2 weeks following your operation, where the wounds will be examined and your dressing removed. After about 6-12 weeks you will be asked to return so that Mr. Cole can check on your progress. You may discuss any concerns you have during these appointments. Alternatively, should you have a concern, you may telephone Mr. Cole’s clinic at any time following your operation. You will only have two to three small puncture wounds. You will not have any stitches, only small sticking plaster strips. Keep the wounds dry until they are healed, which is normally within five to seven days. You can wash or shower and use ice packs, but protect the wounds with a waterproof dressing. These will be provided to you after your discharge from hospital.. Avoid using spray deodorant, talcum powder or perfumes near or on the wounds until they are well healed. The dressing will normally be removed at your first follow-up appointment. Your arm will be immobilised in a sling for about three weeks. This is to protect the surgery during the early phases of healing and to make your arm more comfortable. You will be shown how to get your arm in and out of the sling. However, you should only take the sling off to wash, straighten your elbow, or if sitting with your arm supported. You may find your armpit becomes uncomfortable while you are wearing your sling for long periods of time. Try using a dry pad or cloth to absorb the moisture. Different people recover at different rates. However, by about three weeks following your operation you should find that movement below shoulder height becomes more comfortable. Do not use your operated arm for activities involving weight (e.g. lifting kettle, iron, saucepan) for 6 weeks. Light tasks can be started once your arm is out of the sling. To begin with you may find it more comfortable keeping your elbow into your side. 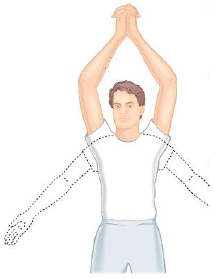 You should also be able to move your arm into most positions, including above shoulder height, although this might still be a little painful. By three months you should feel a lot better. However, it can take from six to nine months to fully recover. You will continue to improve for up to a year following the procedure. You may not begin driving until four to six weeks after your operation or when you feel comfortable after that. Check you can manage all the controls and it is advisable to start with short journeys. The seat belt may be uncomfortable to begin with, but your shoulder will not be harmed by it. In addition, it is a good idea to check your insurance policy. Many insurers will require you to inform them of your operation. The best time for you to return to work depends on how you feel following the operation and on the type of work you do. If your job is largely sedentary with minimal arm movements close to your body, you may be able to return between three and five weeks after your operation. However, if you have a heavy lifting job or one with sustained overhead arm movements you may require a longer period of rehabilitation. It is best to discuss this with Mr. Cole and with your physiotherapy team. You will usually be invited to attend an outpatient clinic 2 weeks after your operation, where the wounds will be examined and any remaining dressings removed. After about 6-12 weeks you will be asked to return so that Mr. Cole can check on your progress. You may discuss on any concerns you have during these appointments. Alternatively, should you have a concern, you may telephone Mr. Cole’s clinic at any time following your operation. Tenotomy procedures are carried out by keyhole surgery. This means you will only have two to three small puncture wounds. You will not have any stitches, only small sticking plaster strips. Keep the wounds dry until they are healed, which is normally within five to seven days. You can wash or shower and use ice packs, but protect the wounds with a waterproof dressing. These will be provided for you on your discharge from hospital. Avoid using spray deodorant, talcum powder or perfumes near or on the scar. The dressing will normally be removed at your first follow-up appointment. In a tenodesis procedure there may be a small cut over the front of the shoulder. You will be given a sling to wear immediately following the operation. In a tenotomy procedure you will be able to take the sling off within a day or 2 and start early movement. In a tenodesis procedure you’ll need to wear the sling for about three weeks to allow the tendon to heal itself to the humerus bone. You can take the sling on and off as you wish for bathing, dressing and exercise, however. You might also find it more comfortable to wear your sling at night. Different people recover at different rates. However, you should be able to start simple exercises, with the guidance of your physiotherapy team within a few days of your surgery. You should find that you recover quickly, within a few weeks of the operation, although you should try to avoid heavy lifting for at least six months following the procedure. You may begin driving about three weeks after your tenodesis operation or when you feel comfortable. You may get back to driving within 1-2 weeks after a tenotomy procedure. Check you can manage all the controls and it is advisable to start with short journeys. The seat belt may be uncomfortable to begin with, but your shoulder will not be harmed by it. In addition, it is a good idea to check your insurance policy. Many insurers will require you to inform them of your operation. The best time for you to return to work depends on which arm has been operated on, if you need to drive and on the type of work you do. If your job is largely sedentary and uses your non-operated arm, or requires minimal arm movements close to your body, you may be able to return to work between two-six weeks after your operation. (likely to be 2 weeks for a tenotomy operation and 3-6 weeks for a tenodesis operation). However, if you have a heavy lifting job or one with sustained overhead arm movements you won’t be able to work for 6-12 weeks after a tenodesis operation. It is best to discuss this with Mr. Cole and with your physiotherapy team. Begin these exercises a minimum of three weeks after your operation, as advised by Mr. Cole or your physiotherapy team. Begin these exercises a minimum of eight to 12 weeks after your operation. A special programme will be devised for you by your physiotherapy team in consultation with Mr. Cole. They will concentrate on increasing the strength and mobility of your shoulder.